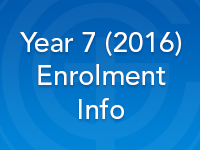 Galen Catholic College would like to announce the following important dates in regard to enrolments for students going into Year 7 in 2016. Applications will be available/open for submission from April 13th 2015. Please contact the office for more information regarding enrolments and tours.